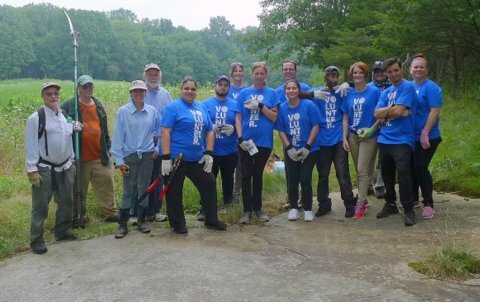 A great group of volunteers from Branford’s Walmart joined a BLT work party in August, removing shrubs, fallen tree branches, and invasive muliflora roses and their roots, from the southeast corner of the Van Wie field. The use of a come-along puller was necessary in some cases to pull out the larger roots and stumps. Our goal is to clear the way for unimpeded mowing to the original edges of the field to keep the old field character and enhance biodiversity. • See more photos on our Facebook page.